This trip is all about beaches, but we ran into a problem finding campsites near some of the beaches we planned to visit. Our alternative is to find one as close as possible with a river or a spring to keep it interesting. Once we crossed the Florida line we had to move inland about an hour to find an available campsite. We found two parks that offered natural springs as their centerpieces. The weather was uncooperative and we had intermittent rain but rain has never stopped our explorations so we ventured out to see the springs. What we found was pretty amazing. The forest really changes around natural springs. The live oaks draped in Spanish moss remain but we also found many more palmettos and palms while cypress knees seemed to sprout everywhere there is a damp patch of ground. The springs we visited are called first magnitude springs. Each produces between 80 and 100 million gallons of water per day from the underground aquifer. The age of the water can vary from one day old to 100 years old. The waters are clear and clean, but lose themselves in the rivers they run to. 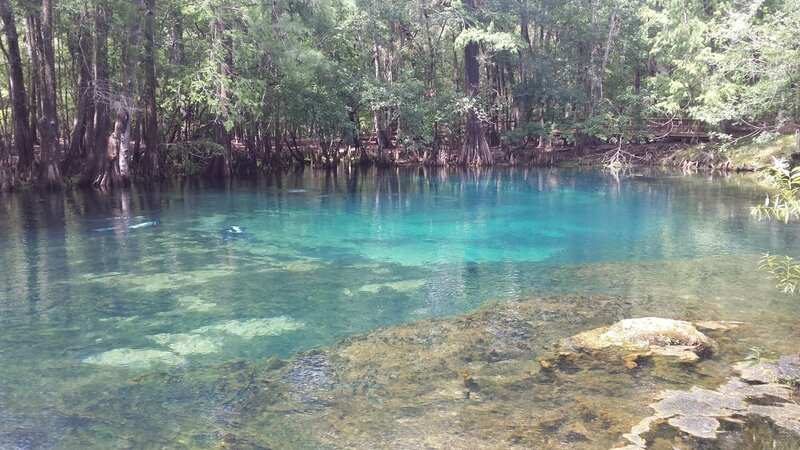 Blue Springs runs to the St. Johns River, and Manatee Springs flows to the Swanee River. Rain and drizzle cast a grey shadow over the park. We donned our rain ponchos and headed out to find the springs trail. Tree branches drooped in the rain and we welcomed a wooden boardwalk to avoid the mud. The park provides multiple boardwalks along the river and to the springs. It felt like we were walking through a tropical rainforest. Sprouting palmettos filled the ground around the boardwalk while live oaks and palms hung with heavy vines and draped in Spanish Moss towered above us. The atmosphere reminded me of a scene from the movie Jurassic Park. I expected to see a dinosaur at any moment. The foliage around Blue Springs reminds me of Jurassic Park! Peeking through the foliage we could see the blue-green water of the spring pool. It seemed to "boil" as the waters pushed their way up from deep below the earth. We learned that over 100 million gallons bubble up from the spring every day and feed the St. Johns River that traverses its channel. The spring water is clear with few nutrients, and the characteristic blue-green color is a result of the algae at the bottom of the pool. Manatees love this place in the winter since the springs maintain a temperature of 72 degrees. They come to get out of the cold ocean and "vacation" at the springs until warmer temperatures and the lure of food draw them back to open water. It is May and most of the manatees are already gone except for a couple of "year-round residents" swimming near the river channel. We met several people getting ready for a swim in the temperate spring water. A few older ladies were giddy with the prospect of jumping in the cool water. Even at 72-degrees, it is a cold plunge. A younger couple, already in the water, floated around the bubbling fountain. Some believe the water has healing powers - a kind of therapeutic bath to ease whatever ails you. It certainly offers a calming aura with its lovely color, lush tropical surroundings, and quiet setting. But there are many signs warning about alligators near the springs and they keep all of us on alert as we step down to the water's edge. I just want a few photos, these ladies just want to immerse themselves in the moment. We both get our wish. They splash into the pool and swim vigorously until they get used to the cool water. I step into the cold water, snap my photos, and wish them well. As Jim and I walk back to camp, I ask him if he would like to swim in the springs, he doesn't hesitate for a moment before declaring an emphatic "No!" Hmm. Maybe if the sun were shining and more people were in the water he might change his mind? I think it would be lovely. Our second springs visit took us to Florida's west coast 30 minutes north of Cedar Key. The weather is much better. The sun is shining and a breeze off the river makes it feel cooler than the actual 80-degree temps. We walked from our campsite along the park road and found the path to the canoe launch, gift shop, and concession stand. Through the trees, we got a glimpse of the aquamarine blue of the springs. Not sure what kind of snake, but I don't need to get any closer! The crystal clear water allowed us to watch tiny minnows swimming near the kayak launch. Algae waved like a mermaid's long tresses in the current. A few scuba divers splashed as they dived into the deeper section of the springs. The water clarity is even better than we observed at Blue Springs and we could see the divers maneuver their way over the rock shelf down to the bottom 25 feet below. I walked down the steps to the water - sets of steps dotted the walkway along the springs to give swimmers several entry points. Obviously, many people swim here! After taking a few photos, I stepped back onto the walkway and leaned against the railing looking over the spring. My eyes drifted down to the water's edge and the rocks lining the pool. There, just under a tree, a snake lay coiled sleeping in the sun. He was large, probably two feet long if he unfurled himself. A spade-shaped head and crisscrossed patterns on his body indicated he might be one to avoid. I will look up that pattern when I get back to the RV. For now, he seems content with the fish dinner he surely had just finished. 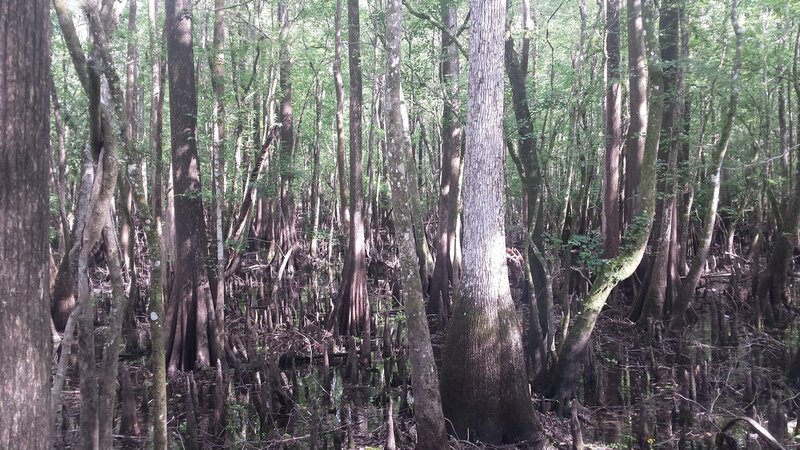 We walked on continuing to gaze at the clear water, the trees draped in Spanish Moss, the cypress knees becoming more numerous as we walked towards the river. A wooden boardwalk picked up where the concrete one left off at the kayak launch. It leads us through a canopy of trees and over a shallow water area that was as still and clear as glass. We could see tiny green plants that I thought were on the surface of the water - until closer inspection showed they lay on the bottom - under the water! Even with cypress everywhere, the water was clear and clean. We spied a huge turtle swimming, and a raccoon foraging around a large tree, its roots leaving openings for him to disappear inside the trunk. 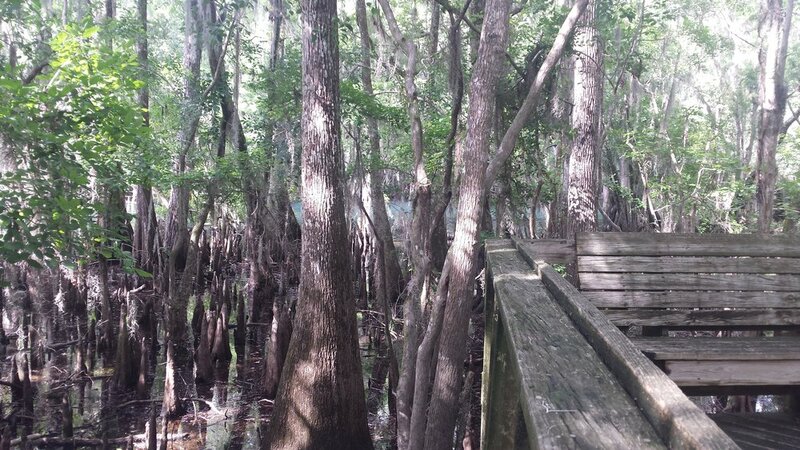 Every so often along the boardwalk, there was an overlook that broke through the canopy to an open view of the springs channel and the Swanee River. At the end of the boardwalk was a large pavilion with a floating dock and a pontoon boat waiting for its next outing. We looked over the vast Swanee River - that song springing to mind, I hope the tune doesn't haunt me all day. The river is broad here and a slow-moving current ripples the surface. The water is dark shrouded in the glare of the bright sun. We could see where the river met the springs channel, the aquamarine water drawing a distinct line at the river's edge. I expected the springs channel to become cloudy as it approached the river and mingled with that dark water, but no, it was quite clear where one began and the other left off. You can see a bit of the spring through the swamp area, both are beautiful. The light through the trees and sparkling on the water makes the swamp other-worldly. We leaned against the railing of the boardwalk leading back to the camp. The sun shining, breeze blowing, we were not quite ready to leave. It was lovely. I stared down at the water, now closer to the spring, the river under me was clearer. Something moved - it looked quite large, perhaps three, maybe four feet long. An alligator? No, it moved more like a fish - a very large fish. If we were closer to the ocean I might suspect a small shark. We watched as it swam slowly against the current almost hovering in place. In the boardwalk pavilion, there was a fish species chart and we walked back to compare what we saw. Nothing seemed that large. Jim guessed a largemouth bass or a catfish, but it seemed too large for that. On the opposite side of the chart was a poster describing sturgeon that frequent the area in warmer weather. These huge fish can grow up to 9 feet long and up to 300 pounds here in the river. That must be what we saw. It made quite a bit of splashing as we approached the dock and again on the other side of the pavilion - but we looked too late. We may never know! We stood there a long time watching the fish through the clear water, then slowly walked back down the boardwalk through the cypress swamp. I noticed another of the black banded water snakes swimming in the water among the tree roots. Note to self: this area is not for swimming! As lovely as the springs were to view and the river to explore, I think the most marvelous part of the day was our walk through the swamp. Birds called out to one another both near us and from far away. The sound seemed to resonate off the trees - almost as an echo. The swamp stretches as far as I could see in one direction and the birdsong seemed to emanate from within that deep distance. All around me the sun sparkled and dappled the clear, shallow water. The dark trees, the sun playing through the branches, the glint on the water, the birdsong... it was ethereal. I would like to capture it on film but I know a photo would not do it justice. Some places you just have to visit. This is one of them.